We have made purchasing The GENERATOR as gift for someone else very simple. 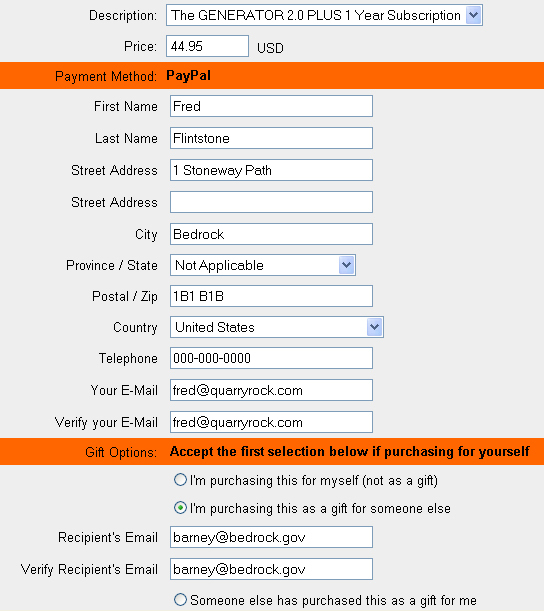 All you need to do is complete the first half of the order form as you would if you were buying it for yourself, then at the very bottom, click the radio button beside "I'm purchasing this as a gift for someone else" and enter the recipients email address (see below example). Upon completion of your order we will email you an invoice for making the purchase, and will email the recipient of your Gift detailed instructions on how to claim their Gift at no charge. Simple Right! Lets Do It! Copyright© Mnn Software Inc. All rights reserved.